Nicola Sturgeon has dismissed the UK government's plans for a post-Brexit customs deal with the EU as a "daft 'have cake and eat it' approach". Ministers have set out plans for an "ambitious new customs arrangement" with the EU after the UK leaves. This could include a "temporary customs union" after March 2019 to prevent border problems during the process. However, the first minister said the UK "should commit to staying in the single market and customs union, period". The customs arrangements document is the first in a series of papers to be published by the Westminster government on key negotiation issues. Businesses had called for clarity since the UK announced it was leaving the EU's tariff-free trading area. Ministers said the plans would mean the "freest and most frictionless possible trade" with the rest of Europe. Reality Check: what is a customs union? The newly-published paper says the UK could ask Brussels to establish a "temporary customs union" after it leaves the EU in March 2019. During this period it would also expect to be able to negotiate its own international trade deals, which it cannot currently do as a customs union member. Once any temporary arrangement expired, the paper says the UK would look to agree either a "highly streamlined" border with the EU or a new "partnership" with no customs border at all. The plan has drawn a mixed response, with Labour's shadow Brexit secretary Keir Starmer calling it "incoherent and inadequate" and "fantastical and contradictory". However, the Confederation of British Industry (CBI) said it was "encouraging", and the Institute of Directors said it was "hugely positive step". Guy Verhofstadt, the European Parliament's Brexit negotiator, tweeted that the idea of "invisible borders" was "a fantasy". Ms Sturgeon posted an initial reaction to the customs union plan on Twitter, saying: "Seems UK gov is back to its daft 'have cake and eat it' approach to Brexit. They should commit to staying in single market and customs union, period." Speaking in Montrose, where the Scottish government's cabinet held a meeting prior to a public discussion event, the SNP leader told BBC Scotland that the plan "would almost be laughable" if the issues involved were not so serious. She said: "You've got the UK government appearing to say that they don't want to say in 'the' customs union, but they want to stay in 'a' customs union, which would be pretty much identical to the European customs union that we're in already. It's nonsensical and ridiculous. "I think it increasingly makes the UK government look like a bit of a laughing stock. "I wish we weren't leaving the EU, but if the UK is leaving the EU then the common sense thing to do is to stay in the single market and to stay in the customs union. Because that will mean we can continue to export goods and services and continue to travel freely like we can today. "I think the sooner we get into a common sense position the better." Secretary of State for Exiting the European Union David Davis said he envisioned the future settlement being "as close as we can to the current arrangements". Ms Sturgeon hit out at this, saying: "Why don't we just stay in the customs union? If it looks like a duck, walks like a duck, quacks like a duck, it's a duck. "They seem to be going to great lengths to differentiate something that is pretty much identical to the customs union from the customs union. That's what makes, I think, the UK government increasingly look a bit ridiculous." While customs is a reserved matter, the paper says the UK government is "committed" to working with devolved administrations "to understand the practical impact of new arrangements. It notes "specific issues" such as the Irish border and "implications" for ports in Scotland and Wales. Mr Davis said: "We will take on board their concerns but our primary aim is to look after the people of Scotland, Wales and Northern Ireland. This is aimed to help them. "For example, in NI we want to have an invisible border between Northern Ireland and the Republic of Ireland, and in Scotland we want people who are running businesses there to have frictionless trade, and that's what it's about." 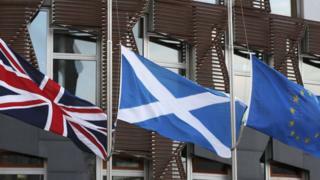 Scottish and UK ministers are set for further talks about Brexit in the coming weeks after the most recent summit in Edinburgh ended in stalemate.